← Arrived and Thriving in Uganda! 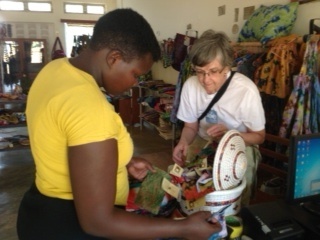 We were interested in buying some Ugandan crafts. In Gulu we found the Wawoto Kacel. It is a cooperative organized by the Catholic Church. They have a small store with beautiful fabric items, necklaces, baskets and other items. There are times when as a consumer you wonder about the conditions under which items are made. What is so impressive is that the craft persons on the premises in well equipped studios. We saw rooms for weaving, sewing, paper-making, bead necklace and dying. I am certain we did not see it all. The women were delightfully interactive as I walked into each area with my camera, wanting to see the pictures. Meanwhile, I had left Betty to finish the shopping with Rachel. 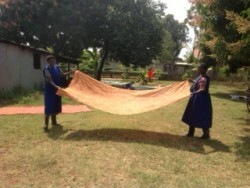 As we left, we watched two women who had just finished dying large pieces of cloth, leaving them to dry on the lawn. It is good to support the people creating the work. On another note, Rachel knew that we were attracted to a certain product in the craft market. Since she is a tailoring instructor, Rachel organized a young woman who just graduated from tailoring school to make for us some I-Pad bags made from locally bought Kitenge cloth. Rachel is also planning on contacting a local basket maker for us. 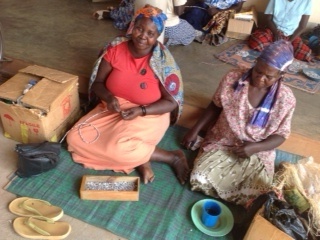 Even shopping is different in Uganda and in the process we are making friends.